This is a story set in a dystopic/post apocalyptic future where the husband and wife protagonists struggle to survive. They are given the option of joining a development, a social experiment where they spend half of their time living a normal life and half of their time in prison. They swap about on a month by month basis with their alternates. An amazing and crazy concept that was taken in so many directions. 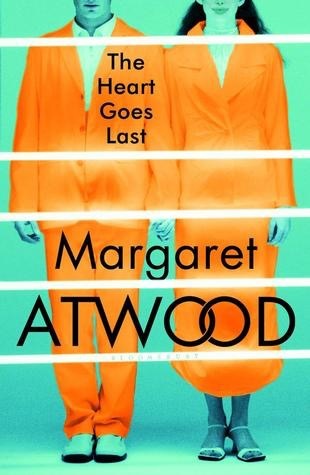 I lived the insanity that Atwood brought to the book. I loved the twists and turns. I loved the motivations, especially of the two main characters and how the changing nature of their marital relationship seemed to drive the plot. I can’t really say much more without giving away some of the surprises but I do very much recommend it. This is another book I picked up in my random ‘smash and grab’ from the teen section in the local library. Of the books that I borrowed, this is perhaps the best and most haunting. The premise is that in the future, there’s a war between the different sides of the abortion debate that concluded in a compromise that pregnancy could not be terminated but that children between 13 and 18 could be harvested for organs as long as 99.4% of their body was used in transplants. The theory here was they would still be alive, just divided. It’s a horrible thought but knowing what atrocities have been justified in the past, it’s just the science that makes it far fetched. The great thing about this book is that it provides a reasonable excuse for the society to justify the disposal on individuals that fall within the age bracket. Neal does a great job of the setting and establishing the horror for those selected. The story is centred around three children who have been sentenced to this fate. What works is the variety of reasons that are given for parents and guardians committing their children to being unwound. The main character Connor is handed over for unwinding because his parents could not control his behavior. The book starts with him finding the order and escaping. Risa is the main female character and she lives in an orohange being raised by the state. They evaluate her academic progress and decide to unwind her in order to respond to budget cuts. The final main character, Levi, is being sent as a tithe. He has religious parents and as the 10th child, he is their 10% tithe (of course they never stop to consider that Levi himself is donating 100%). Through the book there are other children and Neal finds many, many reasons for his society to find children expendable. One is the result of a messy divorce where the parents could not agree on custody. Another child is an orphan sent to live with an aunt after her mother dies and the aunt decides unwinding is the best option so that she can get her hands on that child’s inheritance. The list goes on. It’s sobering to realize that there are without doubt, people in the world who would take the easy way out with their children if it was available to them. Perhaps this is the reason I liked the book so much, the credible story (“You’ll still be alive, just in a divided state” and “change is hard”) allows for denial that everyone buys into. As humans we have lived with denial in the past, have a look at the justifications for slavery during the worst of the transatlantic trade. If you are looking for something that changes a single aspect of our society and created a picture about how we would behave, then this is the book for you. As a book is it part one of a four part series but the book stands alone. It’s an excellent read and literally one that I couldn’t put down. Another book picked up during my smash and grab of dystopian fiction, this time from the adult (non-teen) section. It was a bit of a surprise to see this in the Sci Fi section as it really reads like a teen dystopia. The book has the premise than in the future, the relationships between men and women are regulated. Women at 18 becomes listed in the registry for men to buy as wives. If they are not purchased after a year then they are married to the Government (become low grade workers). Men have an obligation to join the military and only have the right to a wife when their service is complete. The society is very conservative and the rules are applied rigorously. The execution of the premise is messy. It really is. There’s too many holes for it to be believable. Firstly, the society described is too uniform. The U.S. is a diverse place and the book seems to have turned it into a white mono-culture (there’s no hint of other races). Secondly, the structured and rigid nature of the society is so at odds with the modern U.S. it’s hard to see how they would get from the modern society to what is depicted. The selling of women into marriage doesn’t make sense. The expensive ones get sold and the cheap ones don’t and end up in government service? Really, doesn’t seem like a free market in action. I’m sure the lower socio economic classes would happily take a cheaper wife. Men are pushed out of the household, often at birth to be raised by the state. By whom? Really? It ignores the strong need that many men feel to have a son. I just can’t believe that these tough, hardened military men would boot out sons (that they could relate to) and surround themselves with daughters (with the main motivation being profit from their sale into marriage). Really the whole thing ignores basic biology. The characters are a strange lot. The main character, a girl trying to escape an arranged marriage is manipulative and naive. That’s fine. The boy that helps her is a strange fish. Originally introduced as a trustworthy and sympathetic farm worker, he has rather unexpected and explainable bouts of violence. He just not consistent and there’s no explanation for it. The villain is the man that pays the bride price for the main character. He’s too over the top. OK, I get that it’s good to hate the villans but he’s to over the top that he erodes credibility of the story. He throws a law enforcement officer out of a helicopter without consequence. Like really? It’s a different society but if the laws were that permissive, it would be wild west. Essentially, this is a variation on what seems to be a common theme of dystopias that remove rights from women and see how it goes. An interesting and valid topic to explore to be sure but if the story isn’t credible, then it undermines the whole thing. Interesting at first, it never developed the conflict or tension to grab me and carry me to the end. I saw this was having a free promotion on Amazon so I grabbed a copy. One of the seminal works of fiction to include a matriarchal society, it fitted the bill for my review programme as it covers gender equality and accordingly, I started reading it with gusto. The books started well enough with the three male protagonists uncovering a land populated entirely by women. But then things went downhill and it’s not the author’s fault. The book was written for another time and a whole lot of the message that the book was looking to deliver wasn’t stuff I needed to be sold on. Women can do anything and everything which the book then started to show in painstaking detail. This is a major problem with the book in that it fairly soon leaves plot behind and goes into a detailed explanation of the society and culture of the fictitious country Herland. Written in 1915, the level of detail and explanation made a lot of sense. Woman can be leaders, and workers, and planners, and rational with a demonstration for each that proved it in context for the story. The problem was, I already believe all this stuff so the book read like one huge over-explanation. By halfway I was getting tired. By the two thirds mark, I was scanning rather than reading. By the three quarters mark I was skipping pages. The problem is that the author seemed unwilling to add any faults into the society she had created. Perhaps she was concerned that the faults would define the society in the mind on her male readers and therefore chose to exclude them. The is perhaps a reflection of the time that the book was written. The result was she created a society of robots. Women who had no real faults, who accepted the society and fitted into their role with only a hint of troublemakers and hardly any criminal element to speak of. It killed any sense of meaningful risk, stakes or conflict and therefore robbed the book of attention grabbing power. In conclusion, it was interesting at first for historical purposes but can someone please write a modern alternative, this one hasn’t dated well.